Councillors have narrowly voted in favour of a motion to ensure equal employment opportunities are given to former political prisoners in the Dungannon borough. A row has erupted between Dungannon council and a Coalisland homeowner over an disused plot of railway land in the town. The DOE has apologised to homeowners after sending letters that claimed controversial plans for a new supermarket and filling station in Brackaville had failed. Plans to build a new supermarket and filling station in Brackaville have failed after developers did not provide additional information on time. Opposition to the construction of a new supermarket and filling station in Brackaville has gathered pace, with up to 10 homeowners so far voicing their objections to the plans. Proposals to licence three new areas for street trading in Coalisland have been rejected by councillors. Shopping in Coalisland could soon receive a boost as parts of the town are set to be licensed to allow street trading. Could the Olympic torch be coming to Coalisland? 12th July 2011 | By: brendan64 | Comments Off on Could the Olympic torch be coming to Coalisland? The Olympic torch could be passing through Coalisland next summer in the run up to the London 2012 games. 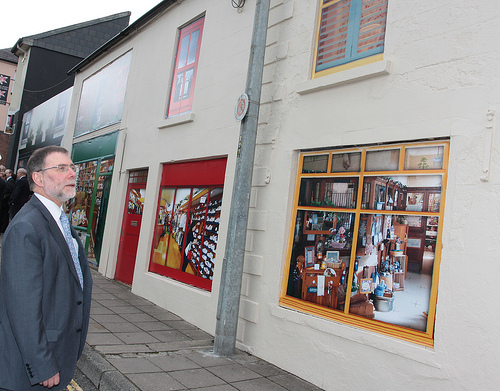 It’s a scene none of us ever imagined we’d see – the Minister for Social Development gleefully having his picture taken on a deeply depressing recession hit street pretending everything was just fine…whilst the journalists watched on fondly.